No one likes for their babies to suffer and to cry when their teeth start to come in. However, parents should avoid using any teething products that contain benzocaine, the U.S. Federal Drug Administration warned recently. The drug can lead to shock, seizures and, in rare cases, even become fatal in infants up to 24-months-old. There are several alternative ways to relieve their teething pain and discomfort. Many infants’ first teeth typically begin to push through their gums at four to seven months old, and by age 3 most children will have around 20 baby teeth. The teething process can be extremely painful for your baby, causing discomfort and tears. 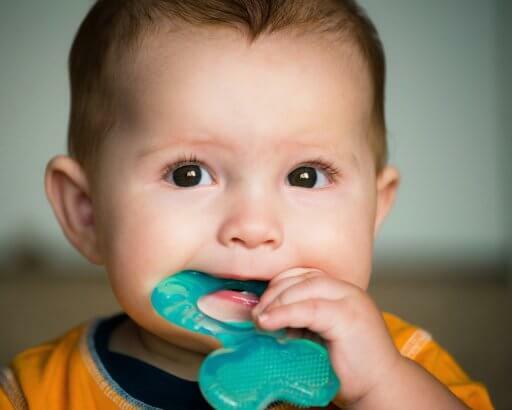 Many parents attempt to relieve the pain by using teething products. However, after first warning of potential danger from the pain reliever benzocaine in 2006 — contained in many teething products — the FDA has now issued a ban on the selling of over-the-counter products containing this drug. The agency found it can harm children 2-years-old or younger and has created a public service video to inform parents or guardians of the danger involved. Giving them a teething ring made of firm rubber. The ring should not be frozen. Hard objects can end up hurting your child’s gums. In addition, parents should supervise their children to prevent them from choking on the teething ring. Rubbing or massaging their gums gently with a clean finger to relieve the soreness. The AAP maintains that pain relievers and medications rubbed on a baby’s gums to relieve teething will wash out of the child’s mouth quickly rendering them ineffective. Additionally, the FDA cautions parents about using certain homeopathic teething tablets with children, suggesting they consult a healthcare professional. Besides those two safe methods, Orange Beach Family Dentistry’s Dr. Lauren Lee and other child healthcare professionals recommend other ways to alleviate pain. You can rub a small cold spoon or moist gauze on a child’s gums to sooth them. “Let them chew on things! It counters the pressure of erupting teeth and can relieve pain or discomfort,” Dr. Lauren said. One natural remedy for teething relief includes brewing caffeine-free chamomile tea. Freeze it like a popsicle or soak a clean washcloth and freeze it for the child to chew on later. In addition, you can soak the washcloth and after it cools down directly apply it to your child’s gums. Dr. Lauren also recommends highly diluted clove oil. However, along with other professionals she said extreme caution should be used. Too frequent of applications can cause damage to a child’s gums. Homeopathic remedies such as tablets or solutions from Hyland’s Baby Oral Pain Relief, Boiron Camilia Teething Relief or Similasan Baby Teething + Tooth Support can also put an end to discomfort. Finally, if your baby has a really tough time teething, turn to a pediatrician for advice about giving a dose of acetaminophen, such as Infants’ Tylenol. All of the above treatments for teething are safe options. As we’ve reported, treatments containing benzocaine can cause infants and toddlers to experience shock, seizures and, in rare cases, turn deadly. Benzocaine symptoms can appear after the first use or even after previous uses. Telltale signs show up anywhere within minutes to one to two hours. Children look pale; their skin, lips and nails turn blue or gray; they experience trouble breathing; get drowsy; have fast beating hearts; or depending on their age, complain about their heads hurting or feeling dizzy. If one or all of these symptoms appear after taking benzocaine, the child should receive immediate medical attention. Over-the-counter products to steer clear from include: Anbesol, Baby Orajel, Cepacol, Chloraseptic, Hurricaine, Orabase, Orajel and Topex, as well as other generic or store brands. These come as gels, sprays, ointments, solutions or lozenges. Orajel, for one, has already added the recent FDA warning to its website. The FDA first warned that products containing benzocaine could be dangerous 12 years ago. The agency received 29 reports of benzocaine-related cases of methemoglobinemia. Of those cases, 15 of 19 appeared in children under the age of 2. Methemoglobinemia causes dangerous levels of methemoglobin in the bloodstream. This greatly reduces the amount of oxygen carried through the body and can turn fatal in rare instances. Hemoglobin is a protein in red blood cells that picks up oxygen molecules in the lungs and transports them throughout your body. Methemoglobin, on the other hand, is a form of hemoglobin that can pick up oxygen but cannot release it. High levels of methemoglobin in your red blood cells can starve your body tissue of much-needed oxygen. In such serious cases, physicians have a few options to treat infants. They commonly use methylene blue, ascorbic acid, hyperbaric oxygen therapy, red blood cell transfusion, or exchange transfusion. Orange Beach Family Dentistry Can Answer Any Questions About Teething! Teething is a normal part of every child’s growth. Following safe and simple remedies like using a firm rubber teething ring or gently massaging your toddler’s gums will work wonders. If you start to feel overwhelmed, call us for professional advice you can count on. Don’t forget to make your regular cleaning appointment with us today!